You will need to choose from our unique hardware range and also a dry ice pack. The hardware will not work without the dry ice! Dry ice in drinks creates fun smoking effects and also increases the aroma of the drink. If you want to use dry ice in drinks you will need to use some of our hardware to avoid the risk of the ice being swallowed. We have products for children’s parties through to cocktail events. For adult drink parties consider our ChilliStick cocktail stirrer, add one piece of ice to the chillistick and place in a glass - the drink will immediately start to fog, this effect is shown in the photo below. Each effect lasts for about 3 minutes and can be repeated many times. The IceBreaker shot glass works in a similar manner and is awesome for enjoying spirits. These products are dishwasher proof and can be re-used many times. If you are planning a big event with lots of guests consider re-using the hardware during the evening so that everyone can experience the fun whilst keeping costs down. We also offer an Adult Party Pack which includes a room fog maker (The Witch's Pail), 5 IceBreaker shot glasses and 5 ChilliSticks. For children we recommend the Smoking Skull Jug with IceCage – really impressive fog effects and completely safe. For awesome room fog effects check out the Witch’s Pail. Our children's Party Pack includes all these items and five free chillisticks worth £7.80! All this hardware is shown in action in the video at the top of this page. You can also choose any of these items from our full range of products from the Shop menu. What dry ice pack should I buy? If your party is on Saturday 28th opt for one of our Halloween weekend offer packs these are all on our Halloween Shop Page. The 4kg pack will be great for cocktail and children's drink parties. The 8kg will provide a number of large fog effects and numerous drink serving options and the 12kg pack will provide many large fog effects and drinks for the larger event. 2.5kg pack - suitable for a small home party for drinks. 5kg pack - suitable for a small home party this will give you up to 5 good effects this pack will also work with all our hardware. 10kg, 15kg and 20kg packs - As above when you want to create bigger effects over several days. 30kg, 40kg, 50kg - for large venues, multiple days and/or outside fog effects. Don't forget if you want to use these packs in drinks you will also need to use our hardware, such as the Chillisticks or Shot Glasses. We expect to run out so please place your order as soon as possible to avoid disappointment. Our courier will send a text giving a timed delivery window and will also leave the parcel in a safe place if asked to do so. Where to start! With dry ice you can provide so much fun for young people. In our hardware range the Skull Jug is perfect as it creates an awesome drink effect but the dry ice is contained such that it is completely safe. When you pour from the Skull Jug you also pour a cloud of the drink - a blackcurrant cloud with Ribena for example! The Witch's Pail will make everyone smile and is a great finale to a party. Put around 6 pieces of dry ice into a coffee mug and half fill with hot tap water and washing-up liquid or bubble solution. This will create an out-of-control bubble monster! This is really best done in a sink, with adult supervision at all time please. Put around 200g of dry ice in a small plastic bowl and place in your sink with the plug in. Do not add water! Wait 10 minutes at which point your sink will be full with invisible carbon dioxide gas. This gas is heavier than air and so will stay in the sink for a short time. Ask the children to blow bubbles into the sink – they will float in a most unexpected way! When finished pour dry ice back into the storage box and pull the plug out of the sink. Place two pieces of dry ice into one of the blue gloves supplied and tie off the end. Watch as the hand grows and grows into something nasty! Do this towards the end of the party as you may need the glove for loading dry ice into our hardware! Ideas for adult cocktail parties? If you would like ideas on what types of cocktails to tickle your appetite consider one of our Halloween Cocktail recipes or even a mulled drink with the ChilliStick, the IceCage dropped in a punch bowl can’t fail to impress (this makes an appearance on our video at the top of this page). When using the IceBreaker shotglass we find neat spirits gives the best fog effect, whatever your tipple you will always end up with a white fog! One of the cool things about dry ice fog is that it hugely increases the aroma of your drink. For a table centre-piece select a container of your choice made from plastic or pyrex glass that will be used as the source of the fog effect. Measure the volume so that you know how much dry ice to add - the ratio is 100g of dry ice to 1 litre of hot water. Just before your guests are seated add the dry ice in the kitchen and place on table - do not leave dry ice in container for more than a few minutes as it will evaporate. Once everyone is seated pour the correct amount of hot water (with essence if you wish) into the container and remember to take photos! We recommend using our ice cage safety device if you think there is a chance that someone will try and put their hand in the container whilst it is fogging. When your guests are seated add hot water from a jug into a container which is in the centre of the table. A dense white cloud will be formed that will pour over the table top. For an added flourish consider adding a scented essence to the hot water that complements your food - the cloud will spread this aroma providing fun and drama for your Halloween Dinner - a simple yet awesome effect. Our products are great fun to use but please follow all our guidelines and remember - a responsible adult in charge at all times please. Dry ice is extremely cold (-80 degrees) and should be handled with care, use gloves to help prevent frostbite burns. Never use industrial dry ice in drinks it may contain chemical, oils or other contaminants, only use food grade dry ice as supplied by Chillistick. Never put dry ice directly into drinks always use a safety containment device such as the ChilliStick or the IceBreaker. Only allow responsible sober adults to handle dry ice who have read the safety guidelines. Storing and Using Dry Ice Always keep dry ice in the polystyrene box supplied. When handling the dry ice, put two of the supplied gloves on one hand; use this hand to touch the dry ice. Use a cup, or scoop to move the dry ice. Read and follow safety guidelines for use of dry ice available from our Downloads section. Click Here to view. 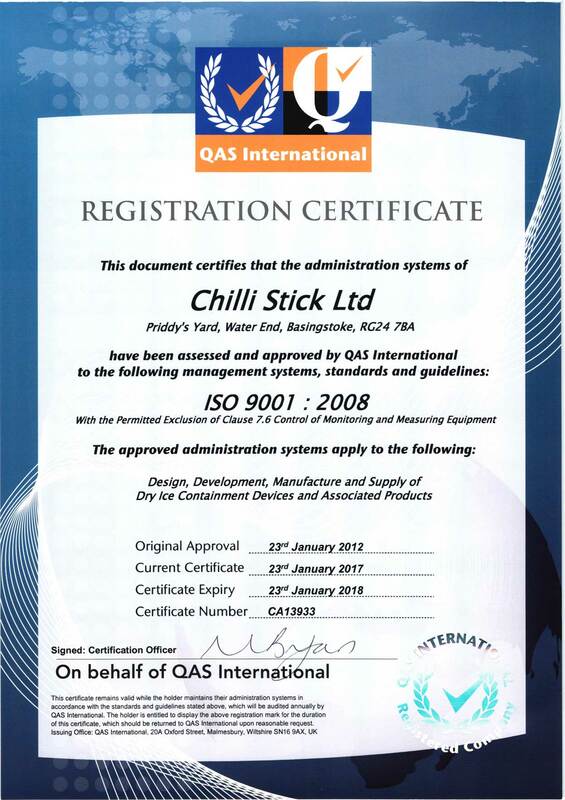 If in doubt contact Chillistick on 0203 432 9412. Dry ice is the solid (frozen) form of the gas that makes drinks fizzy: carbon dioxide (CO2). It has the unusual property of turning from a solid to a gas without passing through a liquid phase and this is how it gets the name ‘dry’ ice. The product can only exist at -78°C and it maintains this temperature by sublimation. Dry ice is solid carbon dioxide - the gas that makes drinks fizzy. When you add water to dry ice pellets you will immediately create a white fog; this mist consists of tiny droplets of water just like a real cloud! 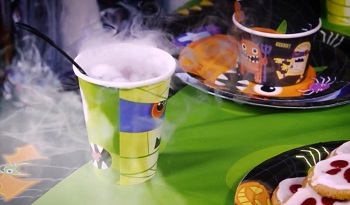 If you are creating fog effects for Halloween you will need to use hot water - please see our recipe for the perfect fog effect in the video above. You can also add dry ice to drinks provided you use our hardware; these include smoking pitchers, smoking cocktails and smoking shot glasses - read on! The only difference between natural fog and dry ice fog is the presence of CO2 gas, this is heavier than air and so tends to carry the white fog towards ground level creating cool effects! The fog will cover the ground, roll down stairs, and swirl when walked through. It will not rise into light beams like glycol type foggers and will not make a fine mist in the air like hazers. Dry ice fog has no odour, contains no chemicals, and leaves no oily residue. Store dry ice in an insulated container - the better the insulation, the slower the rate of sublimation to CO2 gas. The best container is the polystyrene box that the dry ice was shipped in. Do not store dry ice in an airtight or glass container, the sublimation of dry ice into CO2 gas will cause an airtight container to expand, rupture or burst. CO2 gas is heavier than air and will sink to low areas and displace air. At elevated concentrations CO2 can be fatal as an asphyxiant. For this reason always store dry ice in a well ventilated area - avoid unventilated rooms such as cellars, boat holds and walk-in freezers. Note: you can store dry ice in domestic (non-walk-in) freezers provided the dry ice is kept in the polystyrene packaging. The dry ice will release CO2 gas whilst in the freezer however there is no risk of asphyxiation. The freezer will reduce heat transfer into the box and prolong the life of the ice. However do not store dry ice in walk-in freezers as this could lead to an asphyxiation risk if the freezer is not used regularly. Some surfaces left in direct contact with Dry Ice may be damaged by the extreme cold. Adhesives may become brittle and break, so please do not let dry ice into contact with kitchen tiles, or other surfaces which are susceptible to damage from the cold. How Long Does The Dry Ice Last? Dry ice is constantly turning into carbon dioxide gas. After 4 days even our biggest packs will have disappeared! This is why it is important that when you place your order online you specify the day you want the delivery. Our 2.5kg will last for your party but will only last for one night. Our larger packs will last for 2 - 3 days, but it depend how you use it and if you remember to replace the lid...Our weekend Halloween offers delivered on Friday are packed with extra ice so that they will last longer.